The inverter will never be without power when you are in the car again. The Peak cup inverter solves many of the problems with power inverters. First, a power inverter allows you to power many home electrics through the accessory outlet in the car. 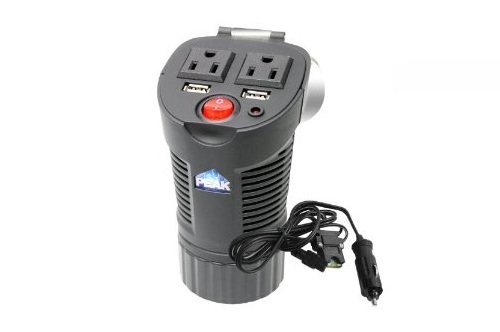 The Peak cup inverter gives you 150 watt of power with 2 AC and 2 USB outlets to handle most laptop computers, cell phones, and audio devices. The design fits right into most car cup holders. Peak inverter is built with a spring loaded hinged lid to protect the outlets when not in use. They also added a back lit on/off switch, so even in the dark you know where to look. Create a mobile office with the Peak 150 watt Cup Inverter. Price: $21.73 & eligible for FREE Super Saver Shipping on orders over $25.